Simple flow chart, ink on dot-grid paper. Are Flow Charts Right for Me? That’s something my yoga teacher says. It means, make a pose work for you. If you can’t bend that far or need something to prop you up, that’s OK. “Do the needful thing” gives me permission to make the practice my own. That’s how I feel about user experience design. You don’t do something because you have to, you do something because the project needs it. In design, as in yoga, do the needful thing. So when someone objects to a tool or technique, I have to scratch my head. Is there something fundamentally wrong with the tool or technique? Or would they just use it in a different way? As long as I stick to principles, shouldn’t I pick the tool that lets me do my best work? For me, sometimes, that’s flow charts. I could start by drawing a few screens, but when requirements aren’t well understood or defined, we get caught in rabbit holes. We end up debating whether something is relevant or not, but absent the context of the whole application. Even if the requirements are clear, you might be working with stakeholders who happily debate the merits of table column widths (true story) instead of validating the content. Flow charts, perhaps more than any other diagram, let me drive conversations at different levels. We can talk about the content of a screen based on what it’s connected to. But because we see those screens in the context of a diagram, I can easily shift to a broader view. When building a tool to support a business process, that process is really just people with vastly different perspectives. It’s like everyone going into the same theater but seeing a different movie because of their experience and background. It’s difficult for someone to look at a screen and understand it from another’s perspective. It’s one thing if you’re building a dashboard or even a payment flow. These are generally one-way affairs. Some of the products I work on have multiple people engaging with data asynchronously. These have countless dependencies. Their “happy path” is really just “what we’d like to happen, not what actually happens.” The inherent complexities make it difficult to start with a single screen to illustrate what this application is about. For some products, you can get the gist of the underlying structure and the overall framework from a single screen. Not so with every project. With some products, screens can’t provide insight into the big picture. Looking at an app screen by screen can’t tell me what happens over there when I make a change here, for example. With some products, I need to understand the downstream impact before I can design what goes on the screen. If I feel like I need a handle on the big picture, I draw a picture to solidify it. For Twitter, it’s the Tweet. For EventBrite, it’s the Event. For your online bank, it’s the Account. A data object is the application’s central concern. It’s the thing that the site is about. It’s a container for information, and it’s tagged with metadata. It’s instantiated and maintained and managed and transformed by the application. It’s how I think about what an app does. To me, it’s organic: it’s a being that needs care and feeding. Until I have a good handle on the anatomy of that data object, I won’t feel confident defining the ecosystem in which it lives. It’s taken decades, but I think I understand how my brain likes tackling problems. It looks at how things move through a system. It asks questions like, “What happens first, and then after that?” And “How does this process get triggered?” And “How often does this occur?” It likes looking at things in terms of its component parts, and with processes, those are the steps and dependencies between them. Following this path builds my confidence — in understanding the design problem and in making decisions about the solution. I always feel rewarded after I go. Not because I have to, but because I need to. Communicating Design, New Riders 2011, by Dan Brown. 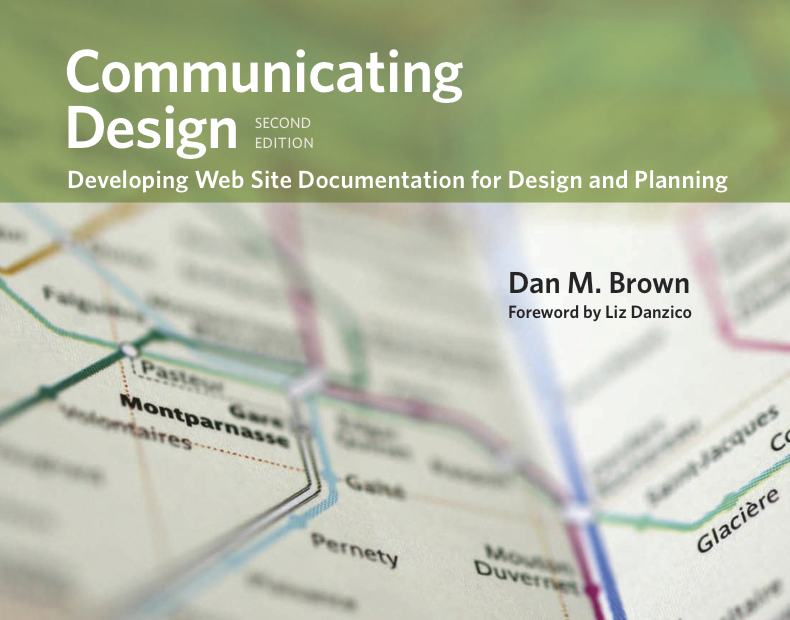 Communicating Design is a book all about design documentation. Maybe you’ll read it because you need other ways to communicate your ideas and facilitate conversations. Maybe you’ll rage-read it because you think documentation is a waste of time. Either way, I hope you read it. Need help with thinking through the flow of your complex application? EightShapes can help with your design discovery projects.